24-Mar-2014 -- The ABSA Cape Epic for 2014 was going to take place in the vicinity of Robertson and McGregor and our one son was taking part and we were going to follow his progress. We love camping so we were looking for a camping facility in that area. After making the booking I wanted to see what the area in that vicinity looked like using Google Earth. I then realized that we were very close to the confluence of 34S 20E and decided that this called for a visit. On 24 March 2014 me and my wife, Rina, set off to see whether we could locate the DCP. It appeared to us that we were camping on the farm where the DCP was located. We tried to get permission from Mrs de Wet, the farmer's wife, but she was not available and we proceeded as we were sure that neither she nor her husband would mind as she told us that we could move freely on their farm. On our way along the farm road a pick-up approached and we stopped it just to double check, it turned out to be the neighbouring farmer and that the DCP was actually located on his farm. He gave us permission to proceed to the DCP. The farm road passed about 500 m east of the Confluence. It rained during the night and the roads were muddy. Because the turnoff towards some labourer cottages near to the Confluence was slippery, I parked on the side of the road and proceeded on foot by myself. I passed the cottages and found myself to be on the wrong side of a fence which I had to jump to get to the DCP. The DCP was located at 16:47 h. It appears that the farmer is preparing the area where the Confluence is located for planting, probably vines. The area is covered in bushes which are about a meter high with the odd patch where there are slightly higher scrubs. From the number of dams in the vicinity it is clear that the farmers must store water during the raining months to irrigate their vineyards during the dry months. 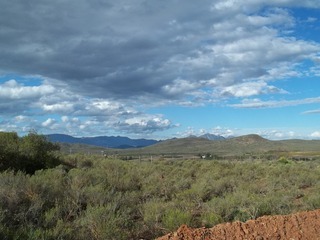 From the confluence point you have a beautiful view of the Boesmans River valley.